For reader discretion this write up on Villanova ball screen actions is based on watching them during one practice. My interpretations might not be one hundred percent accurate with what their coaching staff would endorse. Take it with a grain of salt. 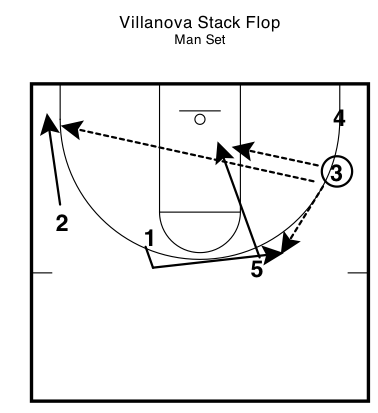 “Villanova Stack Flop” is something that can be run against a team that switches the ball screen. Here Villanova starts in a tight diamond around the paint and then veer out. Once the point guard comes off the screen and recognizes the mismatch the ideal spot is to go back to the five who is popping off the screen. Obviously the point guard needs to be mindful that a quicker player is probably now covering the five and the pass needs to be crisp. Once the five has the ball, it is quickly reversed. In this case, the three gets the ball. It is crucial that the four leaves (preferably to three-point range) the block in order for the five to dive. Not surprisingly this Villanova ball screen principle of getting to the perimeter fits with their overall philosophy of being a team that shoots threes. They love to say “shoot em up or sleep in the streets” as an approach to their no fear approach to taking a shot with conviction. The three then has a few options. The primary option is a lob or a post seal pass to the five who should have a smaller player after the switch took place. The second option is to the point guard who is coming back to the ball hard and can probably take advantage of a quickness matchup off of a shot fake. 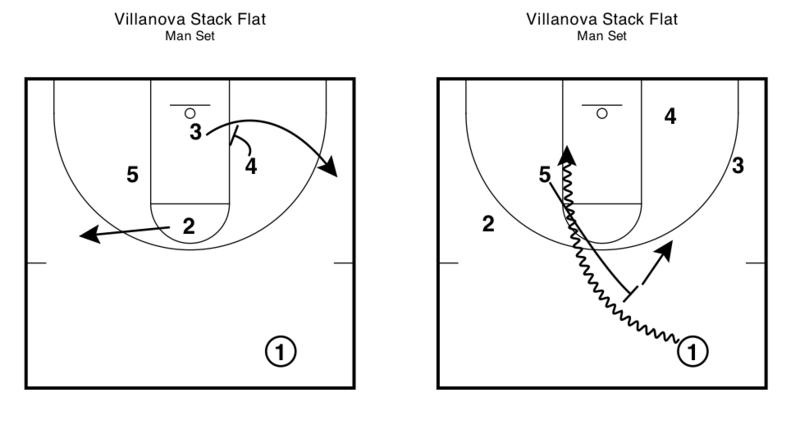 The third option is a skip pass to the corner for two if two’s defender sinks to help on five’s dive. 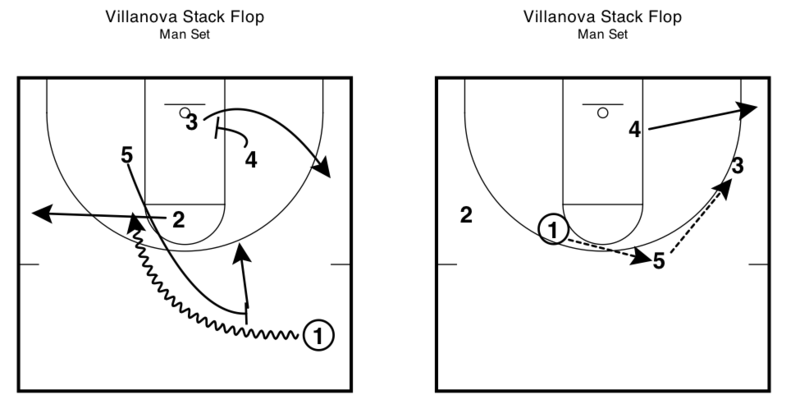 Additionally, if five gets doubled on the catch it’s a quick skip to two in the corner for a three. At the outset of practice (before the dynamic stretch), Coach Jay Wright had the players working on this set. His key point of emphasis was that the point guard needed to get downhill. In Villanova’s offense, players need to think about scoring first all of the time. Here it is really 1’s job to score first before kicking to any teammates. After the walk through of this set, the team went back to it later in practice as part of a live shell drill. And once again, the point guard was not getting downhill, so Coach Wright had to get on him. Here is a brief look at the basic principle of the flat screen in game action. It can be set well beyond half court or as low as the top of the key, but in any case it is critical that the forward establishes position because the defending guard cannot see it. Thus, the violence of the screen will attract a whistle if there is any subtle shift in the forward’s feet.